A Let me give you letrozole sale uk an analogy..
Three things you can do to protect imperiled alpine plants in New York. Teach others to travel and camp on durable surfaces. On the summits, stewards ask people to “Do the Rock Walk”. Encourage people hiking in the High Peaks to “Carry a Rock” to the summit of Marcy, Algonquin, Wright, or Colden, where stewards will place them for restoration work. Support ADK’s Summit Stewardship Program. Volunteers and donations make the difference. Alpine plants live in an environment where no other plants, and no humans, could survive. They have special adaptations that have allowed them to grow and thrive on the Adirondack High Peaks for the last 10,000 years. The alpine zone that we see today is a small relic of what was once an alpine tundra that covered much of New York. Topography, climate, and glacial history created these alpine zones. ADK has determined its top five most imperiled alpine plants from The New York Natural Heritage Program list of highly imperiled plants. Boott’s Rattlesnake Root This globally rare plant is found in fewer than 20 locations worldwide. Its showy flowers are on display throughout June. Boott’s rattlesnake root’s habit of growing along trails makes it particularly vulnerable to hiker trampling. Dwarf Willow A tiny willow tree, this plant was once found in several locations in the Adirondacks until it was trampled to the brink of extinction. Summit Stewards identified what may be the only remaining population in 1998 and continue to guard the location. Fernald’s Bluegrass As few as ten tufts of this flowering alpine meadow grass exist in all of New York State. Unfortunately, that location is very close to the trail near the summit of Mt. Marcy, placing it in extreme peril. Globally rare, this plant is at risk of extinction. Alpine Azalea This tiny version of the common azalea has rose-pink flowers. The only population in New York State is on Skylight. Lapland Rosebay A miniature version of the common Rhododendron is found in small populations on only a few summits in the world. With a growth rate of .06 mm/year, it is both slow to grow and easy to set back through trampling. It has beautiful, showy flowers that take two years to flower. Wind: Strong winds shred leaves, break branches, tear at roots, and act as a sandblaster to plants. Winds on the summits are typically much stronger than in the valleys. Mid-winter sees daily average winds of between 45 and 50 miles per hour. Typically, two days out of three will yield hurricane force gusts (73 miles per hour or greater). It is a rare winter month which does not see winds over 100 miles per hour on some occasions, and a rare winter which does not see winds of 120 miles per hour or greater. The average wind speed for the month of January on Whiteface is 40 miles per hour, gale force winds strong enough to break branches and make it difficult to walk. Growing Season: Alpine plants have only two frost-free months (approximately 60 days) in which to do all of their growing! This is about one month less than valley plants in Lake Placid, and about two months less than a typical ear of corn takes to grow and mature. With such a short time season, alpine plants don’t grow very much in any given year. Ice: With strong winter winds blowing the protective blanket of snow away, most alpine plants spend the winter encased in ice. Ice turns plants into brittle popsicles, making them fragile and prone to breakage. Soil: Alpine soils are very acidic—they have a pH similar to that of lemon juice! They are nutrient poor, consisting mostly of decaying organic material. They also tend to be very wet. All of this makes them similar to the soils found in bogs, which explains why some bog plants are found on alpine summits. The more extreme the challenges posed by the environment, the more diverse the adaptations plants must have to meet these challenges. (Similarly, you put more in your backpack for a winter hike than you do for a summer hike.) Alpine plants have a variety of different adaptations that help them survive on the summits. 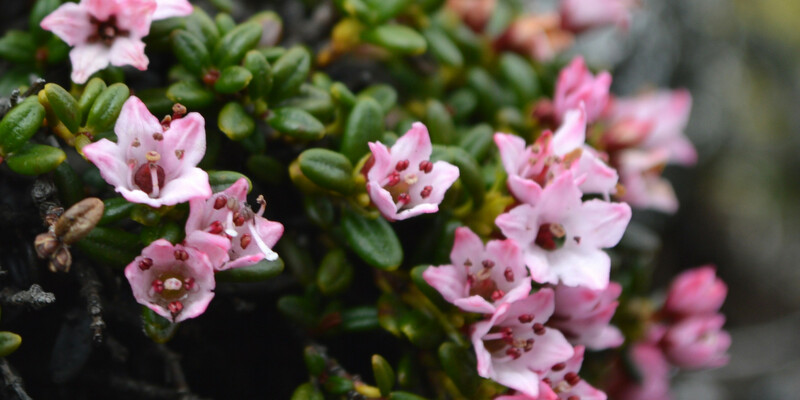 Staying small: Alpine plants stay low to the ground to avoid the wind. Even alpine trees, such as this Bearberry willow, grow across the rocks, rather than upright. Cushion: Many alpine plants, such as this Diapensia , grow in a cushion form. These cushions are aerodynamic and help the plant stay warmer than it would otherwise. 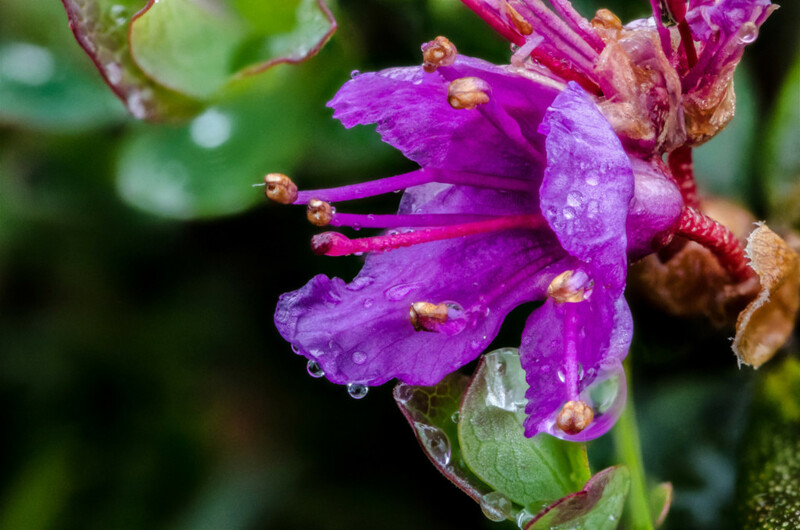 Chemistry: Anthocyanin, a reddish pigment found in alpine plants, allows them to photosynthesize at colder temperatures and in lower light conditions than lower elevation plants. This adaptation is very important since the optimum range for photosynthesis (68-86 degrees Fahrenheit) is quite a bit warmer than the average high temperature for the warmest month of the year in the alpine zone (60 degrees Fahrenheit). Anthocyanin also works as a sunscreen, shielding alpine plants from harmful UV rays on the summits. Life Cycle: Despite their slow growth, alpine plants have a very quick yearly life cycle. They are the sprinters of the plant world—they flower, get pollinated, and set seed in a short window. These plants are long term planners, though. Research shows that they set their flower buds 2-4 years before the flowers will actually bloom. This allows the plants to save up enough energy after flowering to last through the long winters. Learn more with ADK’s Adirondack Alpine Summits field guide.